This entry was posted in Pollution and tagged China, green technology, renewable, solar energy on March 26, 2014 by Jamie Yu. In terms of scale and speed, China’s economic transformation has no historical precedent: since initiating market reforms in 1978 China has shifted from a centrally planned economy to a market based one. In 1978 China was one of the poorest country’s in the world with its GDP only one-fortieth of America’s and only 16% of its population living above the poverty line. Since then it has demonstrated a stunning economic reversal which many deem as the “Chinese economic miracle”: while in 1978 only 16% of its population lived above the poverty line, by 2005 only 16% lived below it; while in 1978 its GDP was only one-fortieth of America’s, with an astounding rate of 8% real per capita GDP growth annually, China’s GDP is now almost one-fifth of the U.S. level. This rapid and sustained improvement in average living standard has occurred in a country with more than 20 percent of the world’s population (population of 1.3 billion people), thus causing China to be the world’s second-largest economy as well as lifting 500 million people out of poverty. Photo courtesy of econews.com. 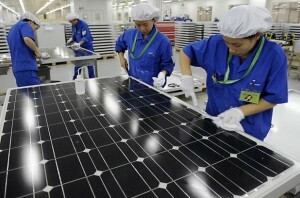 Chinese workers manufacturing solar panels. However, all industrial nations one day hit an environmental turning point, an event that galvanizes the population to realize the ecological consequences of rapid growth. In America in 1969, that event occurred when the Cuyahoga river in Ohio, thick with pollutants, caught fire. America’s Environmental Protection Agency was founded the next year. The rank smog in Beijing could join the ranks of these environmental turning points. A swathe of warm air has settled over the Chinese capital like a duvet and trapped beneath it pollution from the region’s 200 coal-fired power plants. The concentration of pollutant particles hit 900 parts per million—40 times the level the World Health Organization deems safe.